All armour and modifications listed in Fifth Edition Fallout are available, but pre-War armour was most likely manufactured by British or European manufacturers, and therefore would differ in appearance. The power armour we know from the American wasteland would not generally be found in the United Kingdom. The T-45, T-51, T-60, and X-01 series of power armour were all manufactured by West Tek, private contractors to the US Government. While some of them may conceivably have fallen into the hands of wealthy private collectors and been smuggled out of America, for the most part West Tek power armour wouldn’t have found its way to Britain’s shores. However, the British Armed Forces developed its own power armour. A subsidiary of Sovereign Technologies named Aegis Tech produced the Curtana series of power armour, naming the mechanised suits after the ceremonial sword used at the coronation of British kings and queens. Aegis Tech also produced limited numbers of the Gallant, power armour so bulky the wearer essentially becomes a walking tank. Meanwhile, Rise Robotics produced the High Performance Labourframe, a suit designed to aid in construction and other similar roles. The Curtana Mk. I ("Squire" model) features a 13th century Heaume Helmet. The Curtana Mk. II ("Knight" model) features a 15th century Barbute Helmet. The Curtana Mk III ("Templar" model) features a 15th century Salade Helmet. The Curtana Mk. IV ("Paladin" model) features a 17th century Armet Helmet. 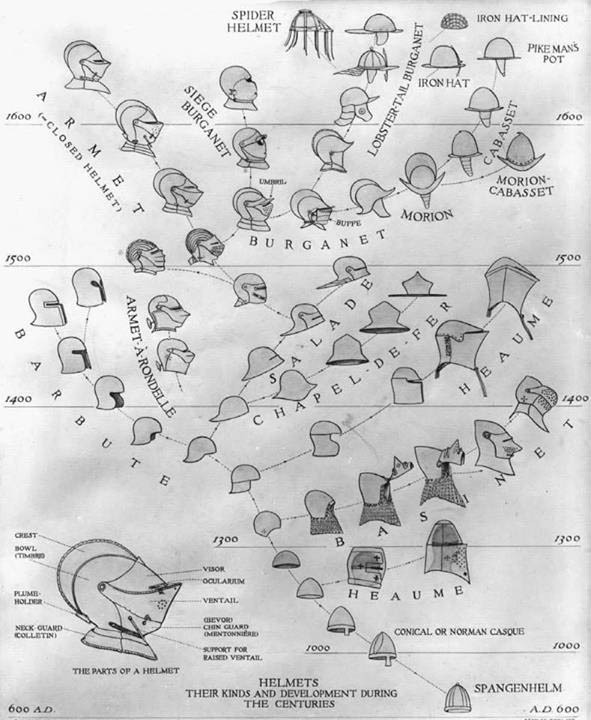 Refer to this reference image for helmet designs. Some suits of Curtana armour were equipped with oversized chain-swords, similar to a ripper. Others wielded electrified maces. Typical ranged armament for a soldier wearing Curtana armour is a minigun, gatling laser, or flamethrower. Eden Knight Templars in particular are famously associated with the latter weapon, and a Templar squad generally includes at least one member with a heavy flamer. 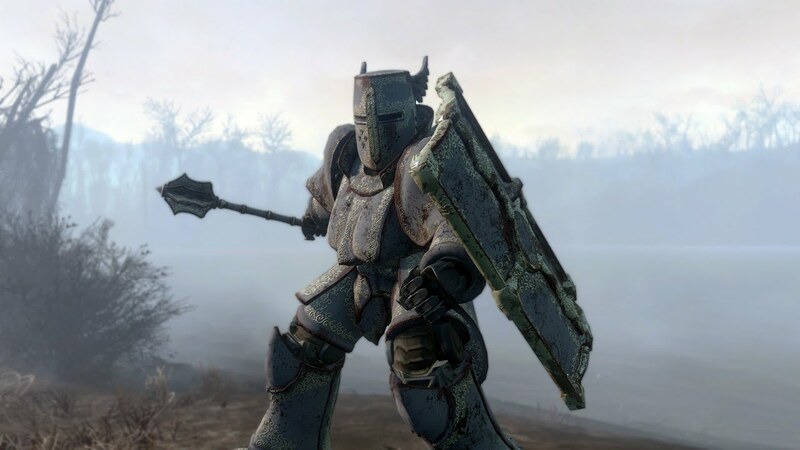 Gallant power armour has the same medieval knight aesthetic as the Curtana line, but is grossly oversized as though designed to fit an ogre. It's so large that when the armour opens to allow its pilot entry, a short ladder leading up into the cockpit descends from its back. New special rules associated with certain pieces of power armour in Fall Britannia are shown below. Clumsy. Due to its design, clumsy power armour is incapable of handling any object of Tiny or smaller size, and its wearer automatically fails any attempt to perform a tasking requiring delicacy or agility. The wearer has disadvantage on any Dexterity ability checks they are able to perform at all. Fixed. Fixed power armour is designed to be permanently affixed to its frame, and cannot be removed from the frame without access to industrial tools. It is therefore not customisable under normal circumstances. Nonmodular. Pieces of this power armour are non-standard, and cannot be used with other power armour frames. Similarly, other power armours cannot be added to the frame of the nonmodular power armour. Radiation Shielded. Power armour with this property grants immunity from radiation damage and Radiation Sickness for as long as it remains sealed. If one or more of the pieces is reduced to zero hit points or removed, the power armour no longer grants immunity to either radiation damage or the Radiation Sickness condition. However, the remaining pieces are treated as though they had the Lead Plating material modification. The special rules associated with specific types of power armour are listed below. Gatling Laser (left arm). As the ranged weapon of the same name in Fifth Edition Fallout. Power Fist (right arm). Melee weapon which deals 8d6 bludgeoning damage. Grenade Launcher (underslung on the right arm). Doubles the range of a grenade. Labourframe (all). A labourframe has pincer arms which can be used as bludgeoning weapons dealing 3d6 bludgeoning damage.